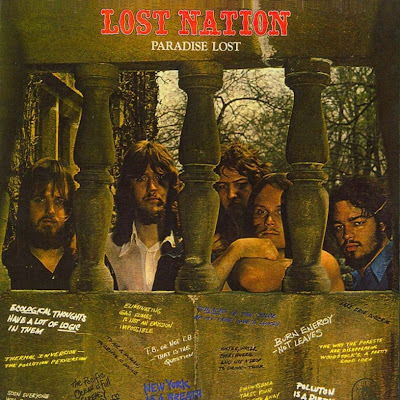 I came across the Lost Nation album with some old favorite albums in a box. It was given to me from Craig Webb who, at the time was working for a store called Chess King in Southland Mall. It had to be in 1970! Oooh, awesome. Relatives and members own opinion! I feel honored, because I helped in the rescue of this jewel of American progressive-rock (in the comments of the mp3 file appears your server). In fact, the album was recorded as a first experiment and adapt them to the covers CD size ... were my first jobs and were in a yellow that does not match. I hope to improve this record. Congratulations, Ron. It's a really gem. I was the Drummer on this album. The notes on the cover are correct. The grafitti was added post production at the Motown studio.